If you didn't even knew about Nautilus extensions before, you might want to check out our collection of 6 useful Nautilus extensions and scripts first. Nautilus Flickr Uploader is a nice and simple application that will allow you to easily upload pictures directly from Nautilus into Flickr. Nice and simple to use and lightweight as well. Nautilus Flickr Uploader app is Free Software (GPLv3) and uses the Flickr API. The the 0.08 version of Nautilus Flickr Uploader was released recently with a number of bug fixes and also includes Russian translation. Download Nautilus Flickr Uploader .deb Package for Ubuntu/Debian. 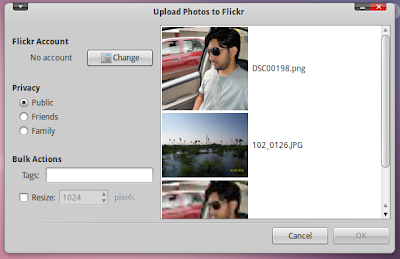 Double click to install Nautilus Flickr Uploader in Ubuntu/Debian. If you are using Fedora or any distro other than Ubuntu/Debian, download link here.